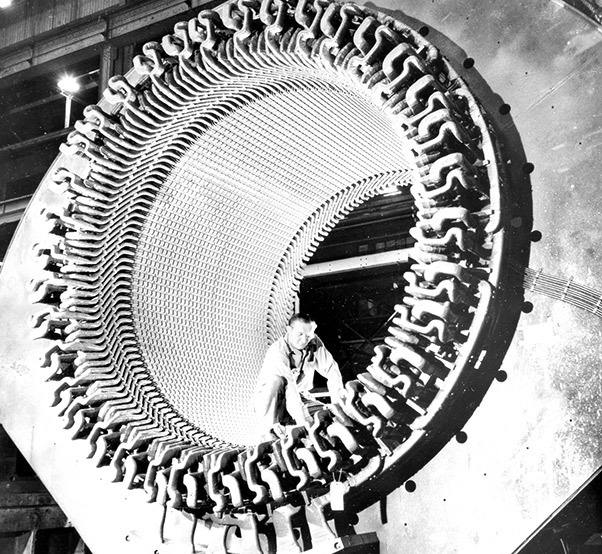 This photo shows the original M4 stator for the Propulsion Wind Tunnel Facility at AEDC during its original construction. The caption released with the photo Jan. 18, 1953, reads, “A workman is dwarfed by the 72-ton stator (stationary outer frame) for the world’s most powerful motor, being built at the Westinghouse East Pittsburgh Plant for new wind tunnels of the Arnold Engineering Development Center. 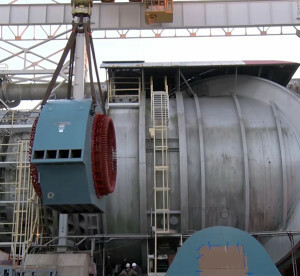 There will be two such electrical giants, each rated at 83,000 horse-power, and weighing 225 tons apiece, for use in new transonic and supersonic wind tunnels, in which compressors will force air through special units at the speed of sound and higher.” This original stator was recently replaced as part of an improvement project for the Propulsion Wind Tunnel Main Drive. The Propulsion Wind Tunnel facility at AEDC is known for its four powerful motors and having the world’s most horsepower on a horizontal shaft for its compressors. In an effort to keep the wind tunnels running at capacity, the M4 stator for the M4 motor was replaced as part of a major investment program for PWT. The previous stator had been in use since the motor was put into service in the mid-1950s. 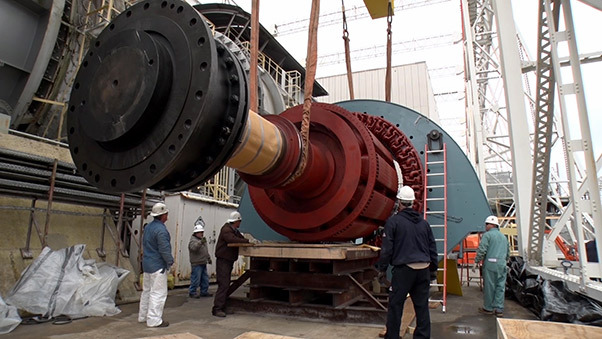 The PWT Main Drive M4 Motor Stator Replacement Project was approved at a cost of $5.5 million and worked by to TECO Westinghouse of Round Rock, Texas. The motor itself was originally manufactured by Westinghouse East Pittsburgh Plant in Philadelphia, Penn. Due to electrical insulation failure, the M4 motor stator was rebuilt at AEDC in 1971 by Westinghouse, the manufacturer, and since that time has been through a lot of tunnel operations. As part of an improvement project for the AEDC Propulsion Wind Tunnel, a new M4 motor stator has been installed in the main drive. The function of the stator is to rotate the main compressors for the PWT 16-foot transonic and 16-foot supersonic wind tunnels. Pictured here are AEDC Propulsion Wind Tunnel craftsmen working to thread the stator. The design portion of work took approximately four months, with AEDC personnel involved in the review process of those drawings. 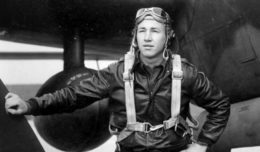 Then the mechanical construction of the stator frame and core components took approximately eight months. In parallel with the steel frame construction, the copper coil fabrication was accomplished in England by Sulzer/Dowding & Mills. TECO began installing and winding the core of the stator in August 2015 and worked a three-shift operation until the first of December 2015. AEDC personnel traveled to TECO for the factory acceptance testing in mid-December. The stator was shipped by large truck/trailer and left Round Rock, Texas, on Jan. 19, 2016, which was unfortunately two days prior to the year’s biggest snowfall in the southeast. A new stator has been installed in the AEDC Propulsion Wind Tunnel Motor Drive. Due to its size and weight, the stator for the M4 motor. The new stator was mated with the existing rotor and placed into position. It was then mechanically and electrically connected and readied for a “magnetic-center” run to determine the proper stator positioning. After repositioning the stator, the final mechanical and electrical connections were made. With the installation of the new M4 stator, PWT Main Drive will be able to return to its maximum torque capability.